Sometimes we enjoy the latter films in a series simply because we like the characters and we’ve become invested in their lives. And I wondered if that was the case for The Last Crusade. Because it resembles Raiders of the Lost Ark. Perhaps in an attempt to right all of the wrongs from that movie. And it does. It takes the first film and improves upon it immensely. Other than the iconic opening scene, Raiders of the Lost Ark drags and doesn’t hold up incredibly well. But Last Crusade is easy to follow and has some really well-constructed action sequences–including a fun scene on a tank that feels like something out of Mad Max. At the start of the film we get a pseudo-origins story for Indiana Jones, which is pretty cool. Set in 1912, Young Indy is played by River Phoenix. It’s not terribly relevant to the rest of the film, but it’s definitely fun for fans. Years later, in 1938, Indiana Jones (Harrison Ford) finds out that his father, Henry Jones, Sr. (Sean Connery) has gone missing in pursuit of the Holy Grail. Now Indy must find him and get to the Grail before Hitler’s Nazis do. The journey there is far better than the one to the Ark of the Covenant. It doesn’t give away the mystery right away, which keeps the audience along for the ride. It’s more of a Western compared to the first two. It’s not dark like Temple of Doom. It’s pretty light. In fact, it borders on farce on a couple occasions–even poking fun at itself. It has some genuinely great comedic instincts, with Connery’s character providing good opportunities for humor. He and Ford have solid chemistry, but the film doesn’t try to say too much about their characters’ relationship. Even though implications arise that they’re close, it’s unclear if this is even intentional, since these ideas are contradicted a few times. For most of the film, Henry, Sr. acts like a bumbling old man who hasn’t yet caught up with the changing times. But he never settles into that role convincingly enough. At first they have him acting like a strict and neglectful father, having us assume that Indy resents his dad. But that’s soon abandoned and forgotten about. There are some other more innocuous plot holes and convoluted details, but they all get fleshed out in the end. The camerawork here is really impressive. I know the first two films have their fair share of iconic shots, but honestly, overall this movie might have even more well-deserving ones than the previous two. Raiders of the Lost Ark has a memorable ending, but the ending in The Last Crusade is just really cool and mystical. In a way, representing the type of reward that Indiana Jones wishes to get out of all of his expeditions. We, as an audience, feel it too. A perfect way to wrap up the original trilogy. I’m never sure how I feel about Michael Keaton. He always has such unorthodox delivery in his performances. I can’t deny the personality he brings to his characters. And a lot of the time that’s what makes certain performances so good. But he has such a specific style, that at times he seems a little out of place. Not every role is fit for his idiosyncrasies. At times you feel that way about his role as Bruce Wayne. He does an okay job as Batman, but his usual tongue-in-cheek style gets somewhat stymied as Wayne. You can tell he’s holding back, but then other times he doesn’t, and it seems out of place. The result is a character who is neither stoic nor hyper. He’s just lethargic. The premise is pretty convoluted, so I’m going to bare-bones it. The Joker (Jack Nicholson) becomes Batman’s first true supervillain as the Caped Crusader tries to clean up the streets of Gotham City. Nicholson is the obvious standout in this film. He’s a psychopath who makes you uneasy just because you know he literally has no conscience. Over the course of the film, the story turns into the Joker attempting to create some sort of political race with Batman to become the city’s favorite bad guy. It’s twisted and doesn’t make much sense–but in the most intentional way possible. The way only the Joker could pull off. But this trend continues as other characters have muddled motives also. The Joker’s motives are supposed to not make sense, but the rest of the characters’ still should. There’s some backstory in the first 45 minutes of how the Joker comes to be, but it’s confusing as well. Watching the film now, it’s an exercise in nostalgia, but it’s still a very slow watch, sagging all throughout. However, the dialogue is snappy and holds up pretty well (the dialogue does–not the movie as a whole). The movie is definitely dated and would never fly as a Batman movie these days. Post-Christopher Nolan, we as a society have become extremely picky about our Batman films. Before about 15 years ago, it was hard to accept any sequel as serious–give or take a select few. And I’m sure there were many who didn’t take the Ghostbusters sequel too seriously either. But who could blame them back in 1989. Sure it has its issues. The villain’s modus operandi has devastating effects, but his method of using a baby’s body as a vessel to come back from the dead is played off as silly. Although it doesn’t intend to be, it can’t help it. The levity of the film is that strong. In this one, all the guys are back and they have to stop the evil Vigo the Carpathian–who is trapped in a painting–from coming back from the dead and ruling the earth. Weird things start happening all over town, as the ghostbusters discover that all of New York City’s negative energy has been compiled into slime in the sewer system and is acting as a portal to bring back evil spirits. It isn’t easy for them, as they are faced with adversity that doesn’t make much sense. They go from being the popular saviors of the city, to all of a sudden no one believing in ghosts anymore. Ultimately, the film lacks any real depth. Character issues are heavily introduced but never resolved in the end. It gets a little lost in that department, sure. But there is a charm that carries over from the original. In fact, I find this one just as funny. The talents are far better utilized here, other than Bill Murray, who is just as good as he is in the last. Peter MacNicol is an especially great addition as the oft-confused foreigner, Dr. Janosz Poha, who curates the art museum where the evil painting is being kept. The first Ghostbusters movie is fantastic. It’s legendary. But it shows its age quite a bit. Ghostbusters II may not be as iconic, but it holds up a little better. And although we don’t feel as threatened by our villain, the threat is still very much there. Finally, a Vacation film that is good all around. It puts together the good qualities of the first and second movies to make a solid third installment. Maybe I’m just getting used to these characters and the style of these films, but I’m certainly liking them more and more with each one. 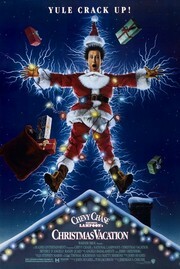 In National Lampoon’s Christmas Vacation, the series goes back to being about Clark (Chevy Chase) and Ellen (Beverly D’Angelo). And it’s never been more evident than by casting a third pair of children to play Rusty (Johnny Galecki) and Audrey (Juliette Lewis)–which has become an in-joke at this point. Clark attempts to have a perfect Christmas at his home, although it’s being made very difficult with a house full of rowdy relatives. This film is far more heartwarming than the previous two films, which are a giant batch of straightforward irreverence. But while that style may turn off some viewers, the well-balanced tone of this third film will have a little bit of both to satisfy everyone. Possibly the highlight of this series is the brilliant running joke with the Griswold’s pretentious neighbors, whose Christmas is getting incidentally ruined as a result of Clark needing to have a perfect one. It speaks of the depth of Clark’s character as well as providing the audience with some of the most amazing pratfalls and farce of the franchise. It’s still very John Hughes-ey in its writing, but it definitely doesn’t showcase any lack of ideas. 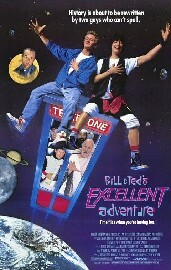 Anyone who knows me is well aware that Bill & Ted is my favorite movie. I’ve been quoting it since I was 10. It’s a film whose sole purpose is to bring joy to the world. It’s a comedy-adventure of the best variety–and that’s my favorite genre. Throw in some time travel and it’s perfect. It’s created to make us laugh and to buy into the normally-ridiculous scenario that one band can bring harmony to the world through the power of their music alone. And the script is so well-written that you believe it, too. Sure, it has a couple of minor time travel paradoxes, but you just don’t care because it’s such an awesome ride that you won’t want it to end! It snubs it’s nose at overcomplicated time travel movies by making itself one that is very matter-of-factly presented, and it has some fun with causality loops while winking at the audience. It calls attention to the notion that when you have a time machine you can literally go back and fix anything you want–or even PLAN to go back and do it later so that you can help yourself out in the present (it makes sense if you watch it). But this movie is so self-aware and so silly and innocuous that you can’t help but love it. Everyone has that film in their life that they feel like it was made for them. Mine is Bill & Ted’s Excellent Adventure.